Meryl has received a Best Supporting Actress nomination for her work in “The Manchurian Candidate” by the British Academy of Film and Television Arts. She shares the category with Cate Blanchett (The Aviator), Heather Craney (Vera Drake), Julie Christie (Finding Neverland) and Natalie Portman (Closer). The awards will be handed out on February 12, 2005. Streep has won the BAFTA Award in 1982 for her performance in “The French Lieutenant’s Woman”. Meryl Streep has received a Golden Globe nomination as Best Supporting Actress in a Motion Picture for “The Manchurian Candidate”. She shares this category with Cate Blanchett (The Aviator), Laura Linney (Kinsey), Virginia Madsen (Sideways) and Natalie Portman (Closer). This is Streep’s 20th nomination for the Golden Globe, holding the record as most nominated actor in Globe history (she’s also the most Oscar-nominated actress of all times). The Golden Globes will be handed out on January 16, 2005. Congratulations! According to ComingSoon.net, Meryl Streep has decided to drop out of Columbia Pictures’ “All the King’s Men”, based on the novel by Robert Penn Warren, reports Variety. Another actress is expected to be announced for the project soon. Streep was set to play Sadie, the aide to Willy Stark. The full article can be read here. According to The Hollywood Reporter, Meryl Streep is in negotations to join Sean Penn, Kate Winslet, Marc Ruffalo and Jude Law in Columbia Pictures’ remake of “All the King’s Men”. Visit their site to read the whole article. Yet, there is no official statement by Columbia Pictures. According to ComingSoon.net, the rumors are true that Sandra Bullock dropped out of “Prime” and is replaced by Uma Thurman. The film has been further joined by Bryan Greenberg as Meryl Streep’s son and Annie Parisse as Thurman’s best friend. An official announcement on Uma is not yet out, as Paramount Pictures still lists Bullock. The 2004 Venice Film Festival will show “The Manchurian Candidate”. Director Jonathan Demme and his cast, Denzel Washington, Meryl Streep and John Voigt are expected to attend the festival and the film’s photocall on September 02, 2004. “The Manchurian Candidate” will run out of competition. Meryl has received a nomination as Outstanding Lead Actress in a Mini-Series or TV-Movie for her performances in “Angels in America”. 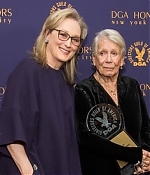 She shares the category with Glenn Close (The Lion Winter), Judy Davis (The Reagans), Helen Mirren (Prime Suspect 6) and Emma Thompson (Angels in America). The mini-series leads the Emmy race with a total of 21 nominations, including for Best Mini-Series, Mike Nichols and his complete cast in the lead and supporting cate-gories. The Emmys are handed out on September 19, 2004. Congratulations & good luck!